The world everywhere lost a beautiful girl with a beautiful soul on Tuesday 16th July 2013. Talia Castellano was a brave Cancer fighter who Earned her wings after years of fighting and years of You tube videos to inspire and show off her incredibly advanced beauty skills. If you haven't already done so, you really should watch her You Tube Channel which is HERE. It will make it pretty obvious why the passing of this angel is being felt all over the world. It is with the greatest respect, love and remembrance that alot of the Nail community will be doing NOTD's in a mint green, which was the last beauty Instagram picture Talia posted four days before her passing. This is mine, and below are links to several other blogs that have also taken the time to celebrate this angel with Mint Green Manicures. Please take some time to look over them, and remember Talia as she would have wanted to be remembered..doing what she did best - beauty. 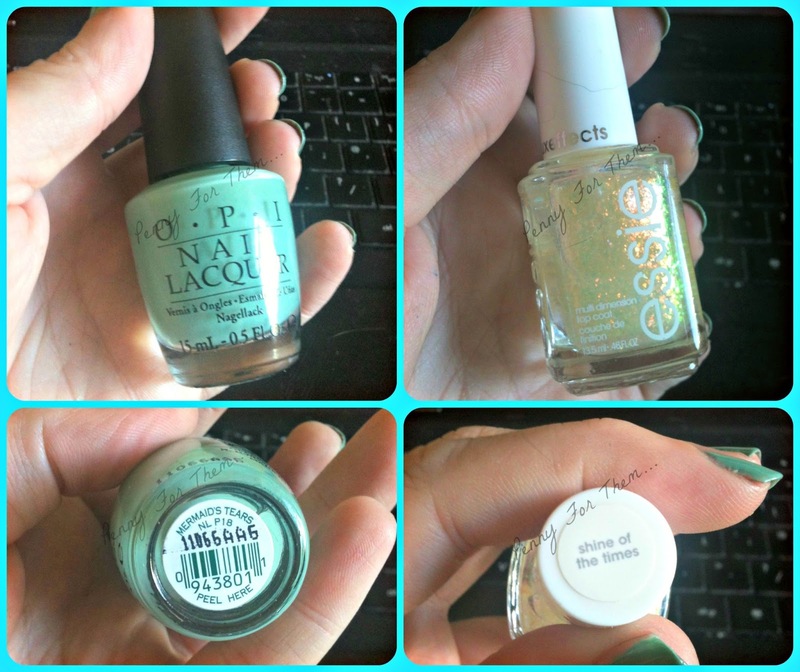 Ive had on my side table a bottle of OPI "mermaid tears" which i hadn't put away with the rest of my polishes....its the only green i own in my collection, and i think it was meant to be used for Talia. No "how to's" this time - just my polish pictures. Then as an added extra, some sort of sparkle had to be added to celebrate Talia gaining her wings...so i added Essie's "Shine Of The Times" over it, and it made it look a totally different polish with a beautiful almost ethereal coat to it. I hope you like these Talia - i hope you can see how you've left your imprint on everyones heart with your beautiful personality and soul. Later today, there will be some other blogs added to here in remembrance of Talia, and it would be wonderful if you could take the time to visit and see all the other Polishers joining together to remember a very special girl.